Yes, yes, I know, this is a horror site but as Bleaux Leaux says "all horror all the time can stunt the creative process". So, I decided to venture outside my comfort zone and take on a drama by one of my new favorite directors, Steven R. Monroe. I'm sure it's obvious by now how I feel about Monroe, Corey A. Jackson and Michael Worth, they're "my guys" and so I struggled with whether or not I could objectively review this film. With that said, I distanced myself from all of that and watched it again and I'm confident that I can give a fair review without leaning toward one side or the other. 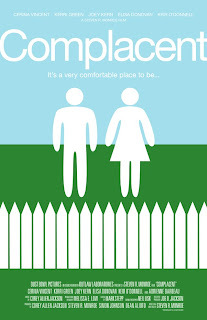 Complacent is a portrait of the middle American lifestyle. The 9 to 5 at a desk job, cookie-cutter homes with manicured lawns, golf three times a week, Florida vacation each year with the family. Only problem.... No one loves the other.... No one strives for more.... No one sees outside his or her own front yard.... They just coast... Question is, can you really go through life like this without deteriorating from the inside? Myah (Cerina Vincent) decides that you can't, you have to do more, want more, care more and it sets off a chain of events within the group of friends that is at times amusing and at times heartbreaking, but eventually fatal in both reality and metaphor. Filmmakers have to be confident in the cast they choose. Monroe has done lots of work with Vincent and Worth and he knows that when he puts a script in their hands, they're gonna knock it outta the park. Which is exactly what they did. They have an amazing onscreen chemistry that makes it possible for them to play off each other's strengths. In fact, the entire cast gave stellar performances but it was Keir O'Donnell who stole the show. His portrayal of the dedicated but betrayed family man was spot on. As a viewer, I always want to be able to relate to a character and he nailed the emotion that comes along with it. Elisa Donovan plays the disrespectful, alcoholic adulteress to a tee. It's evident by their performances that this is a couple in trouble. They also have an onscreen chemistry that helps a lot in the progression of the story. Kerri Green plays Beth, the dependent, mentally abused housewife who wants nothing but to keep the peace between the two sides of her family. She does a great job in this and shows just how much she's matured as an actress since her role in The Goonies. Her character is easily relatable and from the get go you sympathize with her. Joey Kern is Robert, the controlling business exec who would rather spend his days golfing than with his family. His performance was probably the weakest of the bunch but still good. Monroe's wife, Melanie and Christopher Showermancome in as the only happily married couple of the bunch. Their characters aren't really explored that deeply and I'm assuming it's because they ARE happily married. Maybe I'm getting soft in my old age but this film was like an emotional roller coaster for me and I think it's because I can relate to each couple in one way or another. I've been the happily married person. I've been the mentally and physically abused wife. I've been cheated on. I've had the white knight ride in and rescue me so as far as storyline, I feel like Monroe did a great job capturing the despair of the differing situations. He also utilizes the moving/shaking camera shots well which seem to draw the viewer into the story more with a kind of personal POV. Corey A. Jackson, in his first producer role, also did the score and in my opinion, it brings a very powerful feel of desperation to the film. It also just goes to show you how the simplest of scores can make or break a film. There is no gray area with this one, you either like it or you don't. It's slow paced with a lot of music overlayed shots of the characters contemplating their situations. I found it engrossing and sad and at times shockingly realistic. One part in particular had me covered in goose bumps because I felt for every character involved. Again, this is why I don't watch dramas. More often than not they have no affect on me but occasionally, I'll watch one that hits a little too close to home and forces me to deal with emotions that were put away a long time ago. Monroe does give the audience a little glimmer of hope at the end but don't go into it looking for a happy ending because it's just not there. Obviously, there will be people who disagree with me and that's ok. I'm smart enough to know that it's quite possible my emotions are fueling my fondness for this film. Regardless, it's a film that has done to me exactly what Monroe intended it to. It got in my head and played with my emotions and stuck there. Kudos to Monroe and everyone else for delivering a raw, eye opening film that I enjoyed very much. Good for you for stepping outside your comfort zone and for adding it to your horror site.